Clipping is a post photo operation to remove an object from a background or from its surroundings. This is often necessitated in product based businesses or in art work. Once the object is recovered it can be subjected to other photo enhancements. It can also be projected in any different orientation or background. All these can be done without deleting any details from the original photograph. There may be other operational routes for the job but clipping is more precise and economical. The results can be stunning. 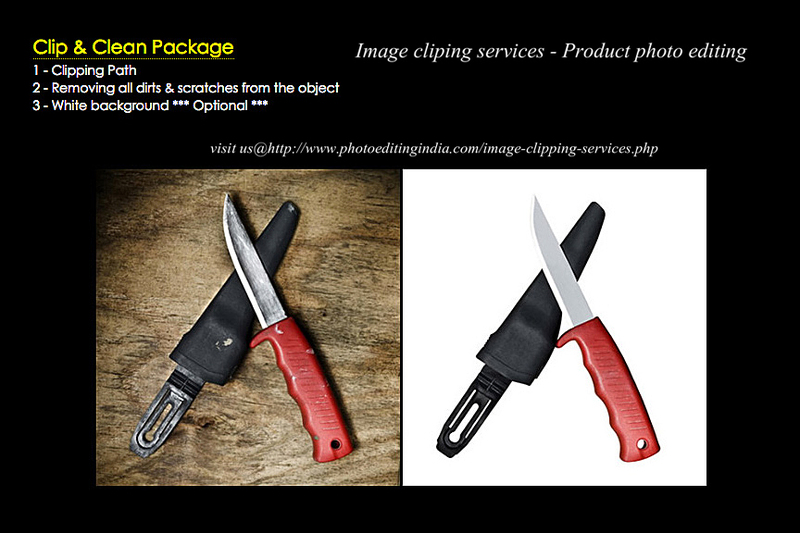 Clipping Path is a closed vector path, or shape, usually drawn with a pen tool to cut out an image from its background. Since the clipping path is a vector it has both value and direction. It is conventional that anticlockwise direction is positive and the opposite negative. The positive direction means that the objects enclosed by the path will be preserved and all the objects outside of the bubble are dropped. The advantage in using the pen tool is that it allows the artist to draw any envelop he desires. The outline can always be changed with ease. This technique finds its greatest deployment in object based industries like fashion and consumer goods. This is used in designing work also. Once the object, be it jewelry, costume or any other its outline or internal details can easily be changed and its effect evaluated. The negative clipping path has also its uses. Typically it is used where exclusion is required. Suppose you have a group photo taken on a particular occasion. The same is to be used to suit another occasion except that persons need to be removed from the photo. You can draw an excluding envelope over the concerned person/s and they will be removed when the clipping act is completed. The remaining photograph can suitably be enhanced and used. This is evidently a shorter method. Similarly it can be profitably used in portrait enhancement work also. These are just a few examples, by no means exhaustive. Needless to say this is a very precise work and calls for a lot of expertise and experience to ensure a high quality finished product. The clipping artist needs the support of high class software and computers to do his job. Evidently the recourse to a professional group is advantages when a large volume of job of a high quality is to be executed within tight time frames. PHOTO EDITING INDIA is such a Professional Image Editing Service Provider. They have state of art infrastructure manned by experienced experts who have the experience of catering to the needs of very demanding clients widely distributed across the world.